Tales Of A Nomad: Hampi- Reminiscence of an empire...!! Hampi- Reminiscence of an empire...!! Geography has always excited me, but this time I decided to take the historical route. The best place to plunge yourself into a historical study is the ruined Vijayanagara empire at Hampi. I took an overnight bus journey to Hospet, the nearest town from Hampi. The climate was quite hot and dry for most part of the day. For long, Hampi has been considered as a hippie's hangout with a huge number of them heading there from Goa ( a hippie's PARADISE). This world heritage centre has a lot of historical importance as it showcases the beautiful ruins of the 16th century Vijayanagara empire, situated on the banks of Tungabhadra river. I hired a qualified guide who explained the historical relevences of each and every sculpture and carving. Without him, I would have ended up staring at every stone, creating my own stories of history. Though I stayed only for a weekend there, most of the major sites were covered. 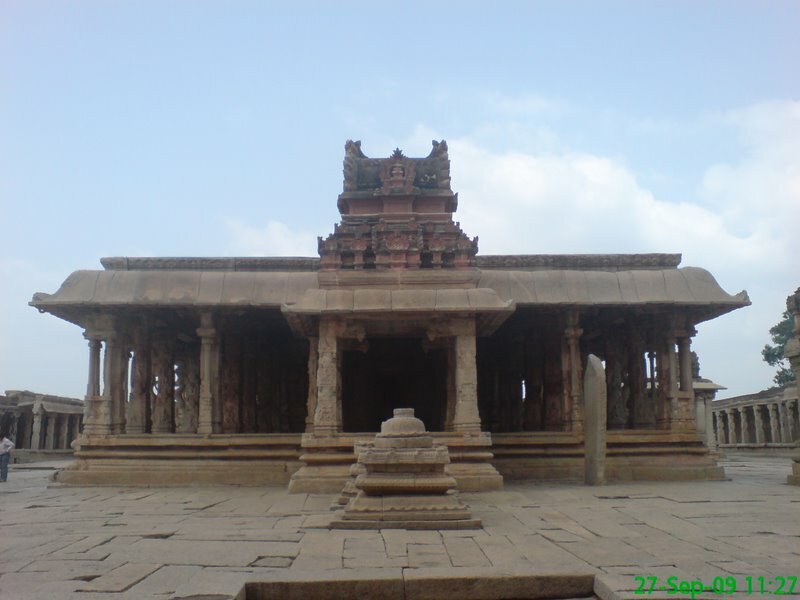 The list included Virupaksha temple, Vittala temple, Queen's bath, Elephant stable, Hemakuta temple, Hampi bazaar, Sule bazaar, Mahanavami Dibba, Kodandarama temple, Lakshmi Narasimha statue, Hazara Rama temple. My guide said that incase anyone wanted a detailed Hampi tour, a minimum of 7 days was required. This is mainly becuase of the fact that most sites are quite far from each other. A vehicle and a guide is a must for the tourists in Hampi. A coracle ride on the Tungabhadra river gave a closer glimpe of the fine figures chiselled on the rocks along the banks of the river.After a lot of study on history, I headed to the Mango tree hotel for lunch. The hotel had a fabulous view of the Tungabhadra river and I enjoyed my tasty lunch with the flowing Ms.Tunga. I would reccomend this place to all the people who are headed to Hampi. I also lazed through the hampi bazaar picking up a a couple of artifacts and souviniers. With its rocky terrain, huge rocks and broken sculptures, Hampi could well be termed as a heaven for archeologists. The excavations are still on and it seems there are lots more to be unearthed. The sculptures and carvings are so beautifully and carefully carved that it must have taken many chiselling years in the making. Staring at the lovely boulders who have been silent witnesses to the fall of the majestic Vijayanagara empire, I visualised a 16th century empire at its prime. Signing Note: Head to Hampi and transport yourself into the world of Kings, Queens and Courtesans. Thanks Kiran. Those words infact refreshed me. Shall surely catch up. Thanks Debby... Its a must visit destination for all. Keep dropping in. Tc. North Karnataka is a heritage lover's paradise. Badami, Pattadakkal, Aihole, Bidar, Bijapur etc are absolutely exceptional. It is so disheartening to hear all those stories, despite it being a UNESCO heritage site. I would strongly recommend banning film shoots withing the sites. It is absolutely fascinating and alluring.